Today is an exciting day for Richmond Dental. We've officially launched our new website, and we couldn't be prouder of it. We hope you'll take a look around to see all the changes we've made. We also hope you'll keep coming back to our News page because we have more exciting announcements on the horizon; for example, we'll be introducing several new products this fall, which will only add to our robust line-up of products for dental professionals. We're willing to bet that Dr. Albert Richmond, who founded Richmond Dental way back in 1895, would be amazed by our online upgrade. (To be fair, he'd also be amazed by the Internet itself.) For over a century our company's capabilities have grown, so we're used to adjusting on the fly to make sure we're taking care of our loyal dental professional customers. Our customer-first approach is evident in everything that we do, and was also at the heart of our website redesign. We wanted to include a more mobile-friendly design. Our new online catalog will make it easier to learn about all of our products. 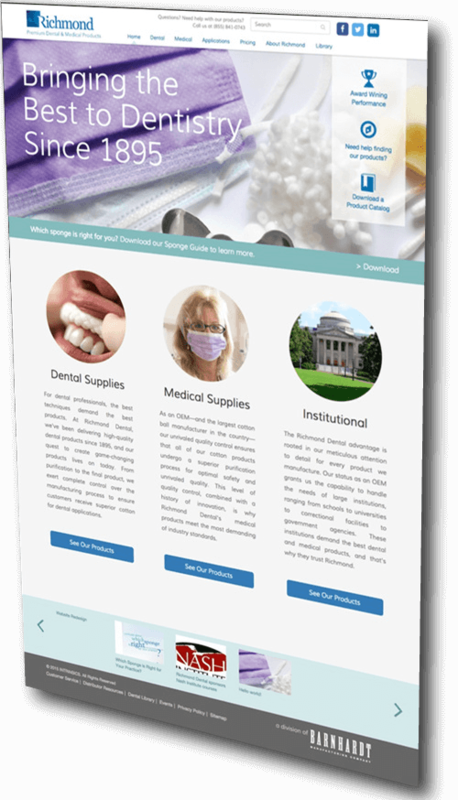 We've created a Dental Library, which will serve as a resource for dental professionals. We've included a calendar of events so you can keep up with everything Richmond Dental-related. Our Distributor Portal will make it easier than ever to locate our products. Ultimately, the site provides far more info and is much easier to navigate. Hopefully you'll find that we've achieved all of these goals. In fact, we'd love to hear from you. Send us a message to let us know what you like, as well as what you don't. Of course, remember that a website is always a work-in-progress. Aside from the list above, we'll continue to add more resources over time. The best way to stay up-to-date is to subscribe to our Dental Library. You'll receive email alerts when new industry information is added.